We’ve spent over 6 fun-filled weeks in Iowa, but all good things must come to an end. Today it was time to get back on the road and continue our travels. Our departure point for leaving Iowa was a bridge crossing of the Mississippi River from Muscatine, Iowa, into Illinois. Just after crossing the river we took a short sightseeing detour upriver to investigate the US Army Corps of Engineers Lock and Dam No. 16. There we learned some of the history of the Upper Mississippi River Nine-Foot Channel Navigation Project. In order to spur commerce on the Mississippi River in 1930, Congress passed the Rivers and Harbors Act that included the 9-foot channel project. The Upper Mississippi River channel is often too shallow for a barge or boat. The type of barge used here needs a minimum of 9 feet of water. To achieve a 9-foot channel the Corps of Engineers built a series of 29 locks and dams on the stretch of river from St. Paul, MN, to the Southern Tip of Illinois at Cairo. The dams form pools that make the river navigable in the shallow areas. The locks are passageways through the dam allowing the boats to travel from one pool to the next. 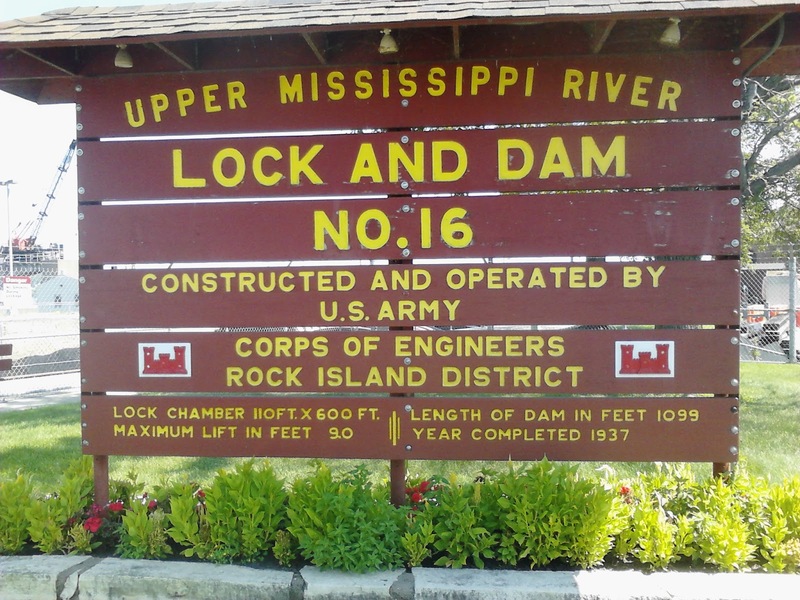 Here across from Muscatine, Iowa, we were at lock 16 of the 29. Looking downriver from the viewing platform we were able to see firsthand how the lock works as a large 15 barge tow was making its way towards the lock. 15 barge tow approaches the lock. Tow doesn’t all fit in the lock. If we would have stayed to watch the whole process we would have been there over an hour. A 15 barge tow is too long to fit into the lock. When a tow of 15 barges locks through, it is required to separate and make two lockages. The first 9 barges are locked through, pulled out and tied off to the guide wall. Then the second half of the tow can be locked through. And just another set of facts and figures that we learned: If all the material (in this case, it was coal) that is being transported on a 15 barge tow were carried by train or truck it would take 240 rail cars or 1050 semi trailers to transport that much coal. So I guess it’s worth a bit of time and patience to work these barges downriver through the dams and locks. After leaving our history lesson on the Mississippi River the rest of the day was spent grinding out the miles on a long stretch of interstate. We are spending the night about 50 miles west of Indianapolis, Indiana, and tomorrow will continue our drive to Ohio.